The Fellowship was fortunate enough to obtain a copy of THE SEVEN-PER-CENT SOLUTION #2 from IDW Publishing. The story is adapted by David Tipton and Scott Tipton from the novel of Nicholas Meyer. The art is by Ron Joseph, colors by Jordi Escuin and letters by AndWorld Design. I’m ashamed to admit it, but I’ve never read any of Sir Arthur Conan Doyle’s books. This book has opened my eyes to the other side of Holmes that is rarely seen in the shows or movies (other than the adaptation of this novel). The Tiptons and Ron Joseph do an incredible job of showing the calm, logical side then the erratic, obsessive side of Holmes. You can feel the concern of Dr. Watson, who will do anything to help his dear friend. This is a great book. 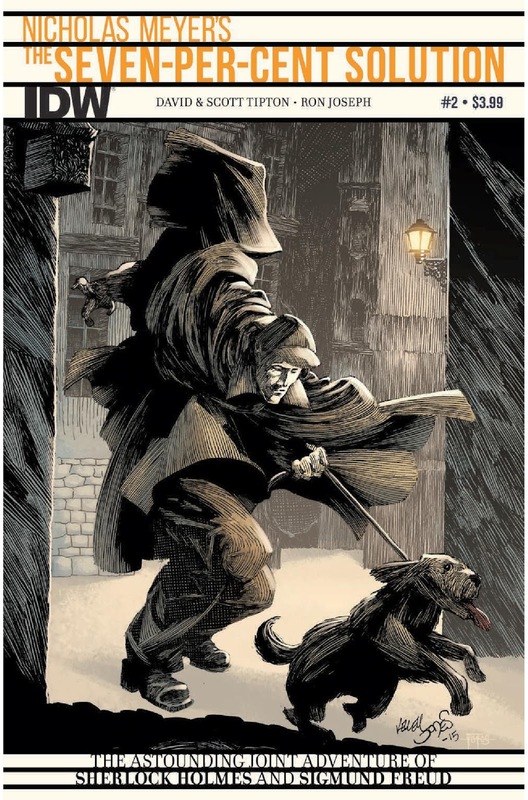 THE SEVEN-PER-CENT SOLUTION #2 is in stores now, or available for ordering at www.idwpublishing.com.